Call 911 for an ambulance and you're likely to have another heart attack when you get the bill. Ambulances are not usually free. They cost a lot to keep on the road and charge a lot to get you from point A to point B. How much will you pay? That's a question almost no one is going to be able to answer for you, especially not the paramedics. 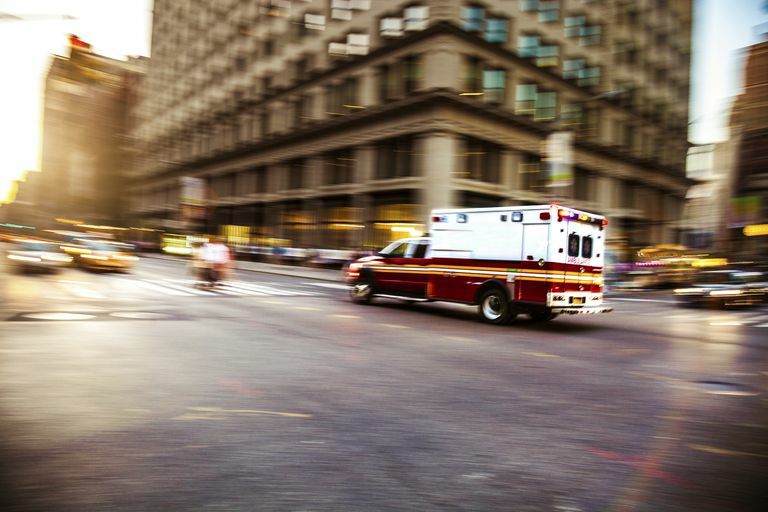 Unlike law enforcement and most fire departments, ambulances are nearly as often privately-owned as they are to be public entities (like a fire department or a public health department). Regardless whether the ambulance agency that responds to your 911 call is run by the government or an investment banker, you probably won't be able to tell the difference. Paramedics are the same whether they work for the government or not. They don't care about bills. They care about treating patients and getting folks to the proper hospitals. And whether the ambulances are for-profit, non-profit, or publically owned, they're all going to send you a bill. In many municipalities, ambulances are the cash cows that help finance the other emergency services (or are thought to help finance while not really helping much). That bill is going to be pretty big. In the U.S., ambulances charge way more than they collect. It is that way all over the country. The reason is the collection rate. The ambulance company might send out 10 bills for $1,500 each. Two of the bills might be paid in full. Another bill will be paid by Medicare at $450. Two more by Medicaid at $105 each. The rest might go uncollected because the patient didn't have insurance or an address to send the bill. Once the $3,660 for all of that is collected and averaged across the 10 ambulance bills, a bill for $1,500 becomes a collection of $366, about 24.4 percent, which isn't all that bad. It's not unheard of for an ambulance company to collect 10 percent of its billings, or worse. That's not unique to ambulances—it's a problem in healthcare in general. If ambulance companies aren't making enough on collections, why don't they just raise the rates? They could, but only a handful of payers are going to pony up the difference. If you raised the rates 10 percent, only the commercial insurers are going to pay the full bill. So after billing out $1,650 ten times, you'll collect $1650 twice, $450 for the Medicare trip and $210 for the two Medicaid calls. Medicare and Medicaid fees are set by the government, so they don't really care how much you charge. The uninsured patients who blew you off the first time will still ignore the bill when it's 10 percent higher. After all is said and done, a 10 percent hike in charges will get you an extra $300, bringing the average to $396, still 24 percent. Part of what makes this whole thing sort of ridiculous is the process for billing. I won't bore you with the details, but the rules for billing are one part voodoo magic and three parts legalese. Start with the Medicare Fee Schedule published yearly by the feds—what Medicare is going to pay—and add in complicated contractual "networks" of commercial health insurers. Ask a medical ambulance biller to explain how the bill is processed. I predict he or she can't do it in a way that makes sense. They can do the billing, but they can't articulate it very easily. It's that complicated. For that reason, the paramedic crew that responds to your call won't be able to explain the bill even if they wanted to. Where does all that money go, anyway? Ambulances are pricey. You don't want to have a paramedic making minimum wage responding to your medical emergency. The medic and the EMT are the most expensive part of the response. According to a paper published by the General Accounting Office, the medical crew makes up about 61 percent of the operating costs for that ambulance. Fuel, rent for the facility, administrative costs, maintenance, and supplies make up the bulk of the rest. Add all that to the fact that the ambulance isn't always running calls. The ambulance might only transport a patient once every three hours. Ambulance managers calculate a number to help them understand how efficient that ambulance company is performing. Divide the number of transports by the number of hours each ambulance is in service. That's called a Unit Hour Utilization (UHU) and is sort of an ambulance batting average. In fact, a good batting average is about what a good UHU looks like; something close to 0.300 or so. The way to use the UHU to see how the ambulance is doing is to multiply it by the average amount that an ambulance trip makes ($366, in our example). So, a UHU of 0.300 multiplied by an average ambulance trip of $366would give you $122, which is what our fictional ambulance earns per hour, less than most doctors. Out of that, all of those expenses have to be paid. You might be wondering why I keep referring to trips or transporting patients. It's because that's the only thing most insurances, including the insurances ran by the federal government, will pay for. They don't cover simply treating patients. A paramedic or EMT could arrive on the scene of a choking patient and perform the Heimlich maneuver, saving her life. If the patient is determined to be fine and not need a ride to the hospital, the ambulance that just saved her life doesn't get a dime. They can bill for helping her out, and many ambulances do. But, the reality is, most insurances won't pay it and most ambulances won't pursue it. So, when ambulance agencies are doing the math to figure out how much money they're making (or losing) they rarely figure in the non-transports. Besides the fact that transporting is the only way to get paid, not transporting is the most common way to get sued. Leaving a patient at the scene of an emergency (or even a perceived emergency) is the most dangerous action a paramedic can take. Evidence suggests that paramedics aren't great judges of when a patient is not that sick. So, there's a chance we could be wrong if we don't take someone to the hospital and there's no way we're getting paid unless we do take them. Which makes more sense, taking or leaving? First, if you think you're having a medical emergency, forget the bill. Go to the hospital and get better. On the other hand, if you didn't call 911 and you don't think you're experiencing a true medical emergency, you can always just take Uber. You always have the right to refuse treatment. Don't do it if you're really sick, but if you want to save money and you don't really need it, always be willing to stand up for yourself. Brown LH, Hubble MW, Cone DC, Millin MG, Schwartz B, Patterson PD, Greenberg B, Richards ME. Paramedic determinations of medical necessity: a meta-analysis. Prehosp Emerg Care. 2009 Oct-Dec;13(4):516-27. doi: 10.1080/10903120903144809. Review. Narad RA, Gillespie W. The public vs private debate: separating facts from values. Prehosp Emerg Care. 1998 Jul-Sep;2(3):196-202.